Posted by Scott Hodgins in eye tracking, Glasses, Market Research, Marketing, Media, neuromarketing, Shopper Research, Technology, Tips And Tricks, Tobii, Updates, Usability & UX. This post is trying to answer some of the most common questions that we get asked – Why should I buy a Tobii? Why is it better? System “X” has a “better head box” and system “Y” is cheaper. The answer from our point of view is simple, the eyetracking is more accurate than using other systems for more people over a longer timeframe. This is a pretty grand claim, why are we so confident? Let’s start at the beginning; Eyetracking itself is straight forward, there are several well documented methods to find and follow the pupil, Tobii uses a non-intrusive video based technique called “Pupil Centre Corneal Reflection” (PCCR). Essentially an IR illuminator is used to help differentiate between the pupil and the iris, it also creates a highlight or glint that we use as well. The Tobii systems use an improved version of this idea, the secret-sauce as it were being a combination of two things, illumination and data modelling. These two areas allow the remote and wearable trackers to monitor the respondents relative 3D position in space, adjust the calibration parameters in the 3D physiological model, and therefore afford a far greater range of movement than similar systems while keeping accuracy and precision. Illumination: Tobii can use up to two different lighting techniques known as bright and dark pupil to optimise the illumination for the participant in that location, and crucially when they move we can adapt the illumination to keep track of them. This allows a Tobii to offer people greater freedom of movement while retaining the tracking accuracy without the need for constant drift correction from the system operator. Data modelling: The Tobii method is different having typically used multiple cameras in their research grade eyetrackers and have done since the launch of the T and X series systems in 2007/8. The advantage of using multiple cameras is that we can physically describe the location of the eye in space. That is to say we know with a very high degree of accuracy where the centre of your eye is, and which eye it is, for every sample recorded. The slightly different images from the pair of cameras in an X2 for example allows the creation of a 3D physiological model of the eyes it is tracking during calibration. This approach allows Tobii to understand the movement of the eye or the eyetracker should one or the other move and adjust the calibration accordingly with a high degree of precision. 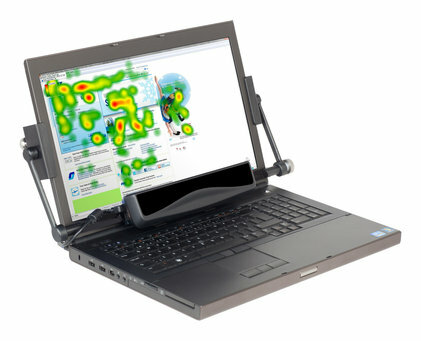 The net result is that the these systems can accommodate movement, even if the head leaves the area trackable by the hardware and can recover tracking when the eyes are visible again, this is one of the reasons people keep choosing Tobii for demanding applications like infant research and in-vivo commercial research. In a recent study Acuity Intelligence recruited 330 people as they were entering supermarkets and didn’t have to turn away a single participant because they could not be tracked – a first for any data collection exercise with this number of people regardless of the brand of technology they were using. Don’t just take out word for it, please challenge us, whether it is onscreen, in the real world or in the emerging AR and VR application areas we can help. Posted by Jon Ward in eye tracking, Glasses, Market Research, Marketing, Media, Shopper Research, Technology, Tobii, Updates, Usability & UX. The Tobii Glasses 2 have been a huge success, with the wide angled field of view, live wireless viewing and automatic slippage compensation thanks to the unique 4 camera binocular tracking more and more people are able to do some great fieldwork both unassisted and in a more traditional context. However as with all glasses based eye tracking platforms the analysis of the data is more time-consuming than with a screen based system as you need to code the user data onto reference images to create aggregated visual outputs and statistical metrics. 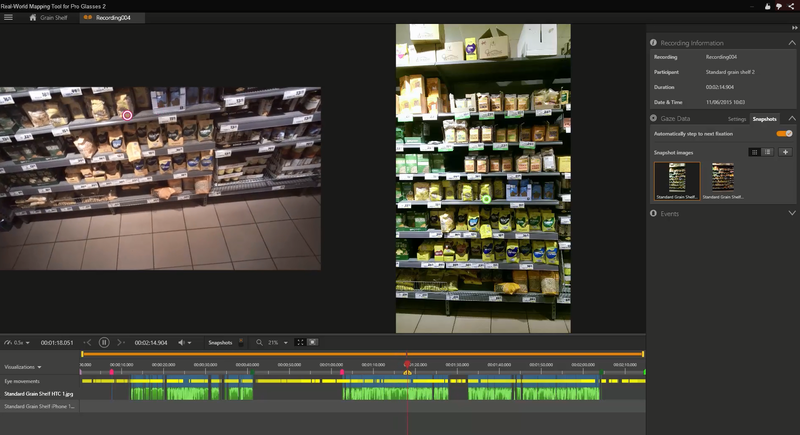 This can be very time-consuming and depending on the type of interactions mapped (fixation or raw data) combined with the environment and task of the user (unboxing a product, retail purchases, driving and so on) can take anywhere from 10 to 20 times the duration of the recording to code – so 100 minutes of total recorded interactions could take upwards of 16 hours to code before you can begin the analysis. Tobii Real World Mapping can help reduce this time considerably in many types of study by using advanced computer vision to automatically detect the gaze points based on the reference images you upload – meaning that 10x or 20x multiplier comes down to as little as 2-5x, and processing can be queued so the software can happily run along in the background freeing up valuable staff resources to focus on other tasks.Once the automatic process is completed you are presented with a chart plotting the automatically mapped points, alongside a confidence level in its accuracy and then any missed points (for example if there was a large amount of occlusion in the frame) or mapped points that need some adjustment can be manually corrected by a researcher. This video has a brief overview of this exciting feature which will be part of next update of the Tobii Glasses Analyzer software. Of course not every single study will be able to take advantage of the new functionality, for example very dynamic content such as sports science studies have few or no fixed reference points to work with, objects that are largely occluded constantly or are at extreme distances will not be viable but for a large number of shopper studies, product interaction, mobile and tablet applications, advertising and navigation tasks users should see a significant time savings to using the tool – and by running a pilot (see tip 28 on Tim’s Acuity Intelligence blog for a reminder of the importance of this : http://www.acuity-intelligence.com/blog/eye-tracking-tips-26-30) you can quantify this benefit and also ensure that your reference images are correct and work well – more about that another time! 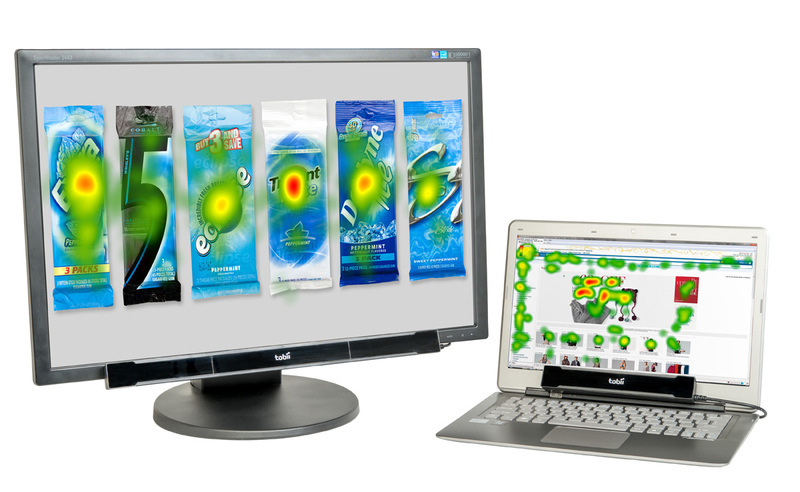 The Real World Mapping is ready to demonstrate to customers now – so get in touch and we will be happy to walk you through it, and show how it can help you process your glasses based eye tracking data quicker! Posted by Natasha French in Advertising, eye tracking, Market Research, Marketing, Media, Shopper Research, Technology, Tobii, Uncategorized, Updates, Usability & UX. Acuity are proud to present the new Tobii X2 eye tracker – a ground breaking development in delivering the smallest and most flexible eye tracker on the market! The Tobii X2-30 Eye Tracker (available in Compact Edition and Wide Edition) is a revolutionary small eye tracking system, powered by the latest generation in innovative eye technology from Tobii. The Tobii X2 family comprises of eye tracking systems at 30 and 60 Hz. The X2 can easily be clipped on to a laptop, a PC monitor, or even a tablet for a compact and is our most portable system yet! Research anywhere – Small footprint accommodates truly portable solutions and enables expansion of eye tracking from lab to real-life environments. Supreme efficiency – Ease of set up and operation paired with very robust participant tracking allow for cost efficient studies. Trust your data – Unparalleled tracking accuracy within a revolutionary large head movement box ensures reliable and valid research results. Choose between the Compact Edition and the Wide Edition – depending on your specific study context! Acuity are offering both rental and purchase options. As always for more information please contact the Acuity team at; sales@acuity-ets.com or (0)1189000795! Posted by Natasha French in Market Research, Media, Technology, Uncategorized. Fantastic news that Thinkbox have been awarded the Grand Prix at the 2012 Media Research Group (MRG) Awards for its research into multi-screening with ‘Screen Life: the view from the sofa’. The study also won awards for the ‘Best Trade Body Research’ and the ‘Best Research Initiative’. This project was carried out by our friends at COG Research for Thinkbox and is a real example of researchers pushing the boundaries of market research innovation by combining cutting edge, scientifically proven technology – such as Quividi – with market research. ‘Screen Life: the view from the sofa’ included an examination of over 700 hours of people being filmed while watching TV in their homes using Quividi, video cameras and recorders (supplied by us) to capture who was in the room and where their visual attention was focused. Quividi is a fully automated people tracking solution that can measure the attention time of an audience using a simple video sensor and image processing technology. Acuity has seen it more commonly used in shopper research to understand the attention time of customers whilst they look at a piece of digital signage, retail fixture, POS or POP. However, it’s always exciting when we speak to commercial clients that embrace new technology and create new applications that help the industry to understand more about consumers – in the case of ‘Screen Life: the view from the sofa’ just how positive a development multi-screening is for TV advertisers. It’s equally as good when industry leaders acknowledge those pushing the boundaries of MR innovation – and encourage others to do the same!!! Posted by Natasha French in Advertising, eye tracking, Market Research, Marketing, Media, Technology, Uncategorized, Usability & UX. Last weekend it was ‘The Ski and Snowboarding Show’, this weekend it’s UCD2012 Conference at Cavendish Square, London…. I suppose you could say we get around a bit! So why UCD2012 and why Acuity? The show aims to give people the opportunity to enjoy real world case studies, inspiring presentations and hands on workshops focusing on user centred design in the real world by offering opportunities for learning and sharing with like-minded people. With UCD2012 being a not-for-profit conference for the community (it’s only been possible due to the presenters donating their time!) Acuity felt it was important to show our support by attending the event and sharing our own experiences and knowledge on the day. With that in mind, on Saturday 10th November, Acuity will be holding interactive workshops with eye tracking and other complementary technologies we offer such as GSR, EEG and wireless biometrics – please note that if you are attending workshops are on a ﬁrst come ﬁrst served basis! Getting there early is advisable! In addition to this, our very own Jon Ward will be giving a talk on ‘Palm Reading for The 21st Century?’ (I’ll let the mystery with that continue until Saturday!) and with talks from our friends at Cyberduck, Amberlight, User Vision, NileHQ, Sapient Nitro and Foolproof – it’s set to be an interesting and informative weekend. With our Christmas night out planned for the evening, it could be eventful too. Posted by Natasha French in Glasses, Market Research, Media, Shopper Research, Technology, Uncategorized. Only 2 days until the Ski and Snowboard Show at Earls Court and I can’t wait! Scott, Tim, Alice, Nina and I are giving Acuity Intelligence a hand on stand G77 to showcase the AMAZING Pivothead Glasses! And what better way to capture all that snow adventure than by wearing the new Pivothead full HD 1080p hands free recording glasses available from www.acuity-intelligence.com These little gems are perfect for capturing all that daredevil snowboard and ski action and at 60 fps, you won’t miss a thing! Don’t believe me? Check it out at: http://goo.gl/1JHrZ Even better, come along and see us at Earls Court from 31st October to 4th November for your chance to win a set of your own Pivotheads! For ticket information go to: www.skiandsnowboard.co.uk or for more information about the new Pivothead glasses contact the Acuity team at www.acuity-intelligence.com or (0)1189 000 820. 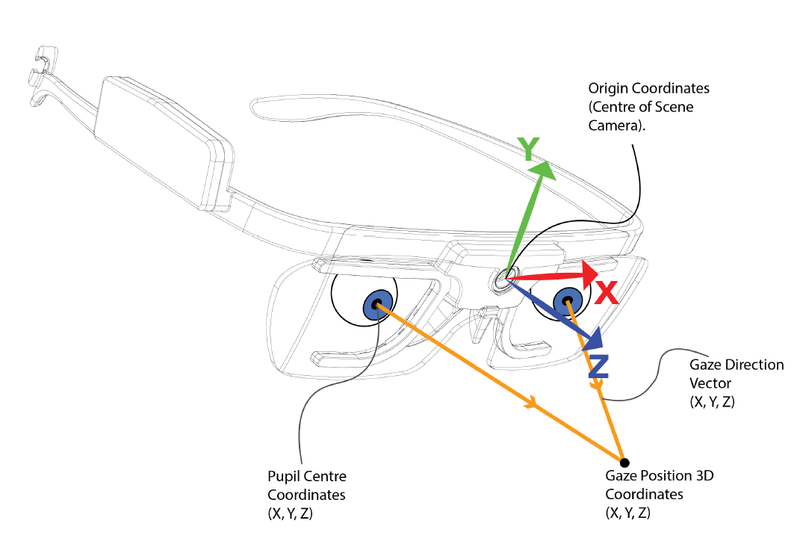 Posted by Jon Ward in eye tracking, Glasses, Media, Technology, Tobii, Updates. Posted by Jon Ward in Advertising, eye tracking, Market Research, Marketing, Media, Studio, Technology, Tobii, Updates, Usability & UX. Earlier this week Tobii launched another groundbreaking product – the X1 Light. The X1 Light can be used with the free of charge Morae plug-in for usability studies or you can use it with Tobii Studio, the most popular eye tracking analysis software in the world! For more information, specifications and pricing please don’t hesitate to contact sales@acuity-ets.com . Posted by Jon Ward in eye tracking, Glasses, Media, Studio, Tips And Tricks, Tobii. One of the common questions we get from clients relates to merging data from different Tobii projects, and more often or not the question is “Why can’t I merge data from two different Tobii Studio Projects?” so I thought it was time to do a little blog post to help people through this and understand a workflow to avoid any potential issues. The main thing to understand is that when a project folder is created within Studio it is given a ‘digital signature’ of sorts which is unique to that project and that copy of Studio. If you want to merge data later on YOU MUST USE THIS PROJECT AS THE TEMPLATE! To give you an example of what I mean by this let’s assume we are collecting data in two locations – at each location I create the test using the stimuli required, put them into a timeline that is exactly the same on both machines. On paper these look identical and you would think you can merge the data – you can’t. The digital signature of each test is different and therefore they are standalone projects, regardless of how identical they may appear. In this scenario you should create the blank project at one location, filling the timeline with the relevant stimuli and so on. Once the test is ready to go, export the project using the “EXPORT PROJECT ARCHIVE” option in the “FILE” menu within Studio. On the second (and each subsequent) location we would then import the test template into the Studio licence there, thereby retaining the digital signature and allowing us to merge data sets at a later date. Once data capture is completed we use the “EXPORT” and “IMPORT” project archive tools accordingly and when we import we get the option to either merge the data sets or have them as separate tests in the library. Please note you cannot merge the tests by doing the quick “copy and paste” style of export. Hope this helps people and reduces confusion! As always fire over any questions to jon@acuity-ets.com or give me a call on 01189 000796 and I’ll be happy to help. Posted by Natasha French in eye tracking, Glasses, Market Research, Marketing, Media, Shopper Research, Technology. TFM&A introduces the brand new OA&A and DM Expo! It’s only 4 weeks away, so we’ve been fitting in preparations for the show – in between trips to China and Singapore! It’s our first year exhibiting at this particular event, so we’re both excited and curious to see how the days unfold. We’ve had stand confirmation – so readers and those with a shared love for eye tracking and all other innovative technology – do pop by and say hello! We’re exhibiting on stand MR9 at Earls Court 2 on the 1st and 2nd March. Hope to see you all there!